Rabies is one of the most notorious diseases that are transmitted through animal saliva. Animals that can be infected by rabies is mammals like bats, raccoons, skunks, and dogs. Rabies is a neurological disease that is transmitted through infected animals bite. Animals can infect other animal or animal can also infecting human with rabies. If an animal is infected by rabies, it can be deadly as it can affecting their brain, making them rabid and develop sudden aggression. If animals get bitten by another animal that is infected by rabies, they will probably have a high chance of rabies infection. They will enter the incubation period, a period where a virus is growing inside the host animals. Rabies is a virus that attacks the brain of the host animal. Once the animal is getting infected by a virus, the rabies virus will grow and attack the host animal’s brain. The incubation period will mostly take 3 to 6 weeks, and in the rare case, it can be more than 5 months. The infected animal will show aggression, over production in saliva, and some also have a tendency to attack like biting and clawing. A human can also get infected by rabies disease. If a human is getting infected by the rabies virus, they will show clinical symptoms like high fever, vomiting, diarrhea, and intense headache. If the patient of rabies virus didn’t take care of quickly, and properly rabies can prove quite fatal. Patient of rabies virus need medical attention properly, and as soon as the clinical symptoms show up. Luckily, there are already rabies medications for human, and fatal rabies infection is nearly never heard of these days. Although human is quite safe from rabies infection, animals like a dog aren’t too safe. Dogs that are infected by rabies virus will mostly get euthanized before the rabies virus can spread into any other animals. Unfortunately, there is no cure for rabies virus for animals yet, so once the host animal showing symptoms of rabies, it is actually hopeless to help them. It is sad to say goodbye to our beloved pooch because of the rabies virus, but luckily we can prevent it from happening for our pooch. There is now rabies vaccination that proves to help to prevent rabies infection for any dog. However, this vaccination is highly debated as many people argue about their usefulness. 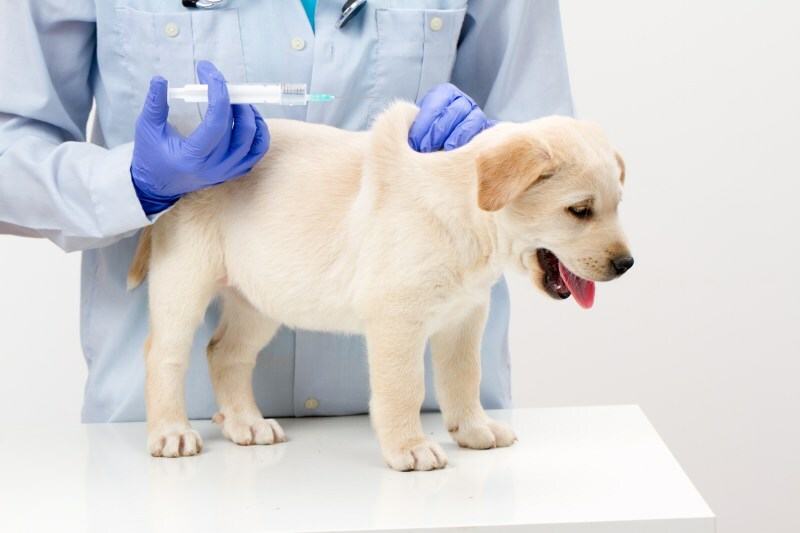 Is it safe for our dog to get vaccinated? Are vaccinated dogs safe from rabies? Here is the answer then. First of all, how the rabies vaccines on dog work? Are you familiar with how vaccines work? If not, let us explain it to you. Vaccination is an injection of a dormant or dead virus to the host. A dormant or dead virus is perfectly harmless if injected to the host, therefore vaccination won’t cause any great deal of harm. How vaccination can prevent the disease? The dormant virus acts as sandbag of the immune system, training the host’s immune system to prevent and deal with that kind of virus, increasing their immunity to that certain virus. Vaccination can protect our dog from a certain virus, and rabies vaccination could prove to be the best prevention of rabies. Rabies vaccination is not only to protect our dog from rabies, but it also protects other people around them in case they’re getting bitten by your dog. However, a dog that is vaccinated need to have updated vaccination, and also an extra prevention step in order for them to be completely safe from rabies. So, are vaccinated dog is safe from rabies? The answer is yes, however, to be extra safe, you also need to do any other prevention, like rabies booster, preventing your dog to go out and contact wild animal if there is a report on rabies outbreak, and immediate contact with vets if your dog is getting bitten by wild animals. To help further prevent your dog from getting rabies, here are some steps that you might need to do. Rabies immune booster can help boost your dog body immunity, and help at least preventing rabies disease to attack your dog. With rabies booster, plus updated vaccination, your dog will be very safe against rabies virus. Wild animals are a very common rabies carrier. Wild animals like skunk, raccoon and bats can carry rabies disease, and if our dogs or cats get bitten by them, it can be very dangerous. Try to prevent your pets to contact with wild animals, especially if you heard there is a rabies outbreak in your area. Even with up to date vaccination, it is always safe to at least prevent your dog to contact potential rabies carriers. If your dog is getting bitten by wild animals, then you need to quickly contact the official government, and make an appointment with your vets. An official government can help you instruct what you should do, and also give proper information too. Vets can help you determine if your dog is getting inflicted by rabies or not, and can also help you to prevent it. If animals that bite your dog is on the lose, then you should contact animals and pest control. They will order for that animal’s capture and help to prevent any other biting incident. So, is it safe for our dog for vaccination, and should we give our dog vaccination? Well, in some state, and regency, dog rabies vaccination is a must and mandatory by a government to prevent any rabies outbreak in the town. Rabies can be a devastating disease, especially if it becomes an outbreak. Vaccination could help to prevent it, preventing any lost of life from our beloved pooch, and preventing harm for everyone around them. So, the question on are vaccinated dogs safe from rabies? Here is the answer, Is it yes of course. Did our article help you? Comment and give us your opinion here relating to our dog, dog disease, and anything you could share to help everyone become a good master for our pooch.